A team of researchers at the Georgia Institute of Technology has found that black soldier fly larvae maximize their eating efficiency by pushing non-eaters out of the way, causing the emergence of a fountain shape made up of larvae bodies. In their paper published in Journal of the Royal Society Interface, the group describes their study of black fly larvae and their eating habits, and what they learned. Black fly larvae (also known as maggots) are known to be voracious eaters—a video of a horde consuming an entire pizza in just a couple of hours has been available for viewing on YouTube for several years. After seeing the video, the researchers with this new effort wondered how they were able to do it so quickly. To find out, they set out pieces of food for groups of larvae and used a high-speed camera to capture the action. 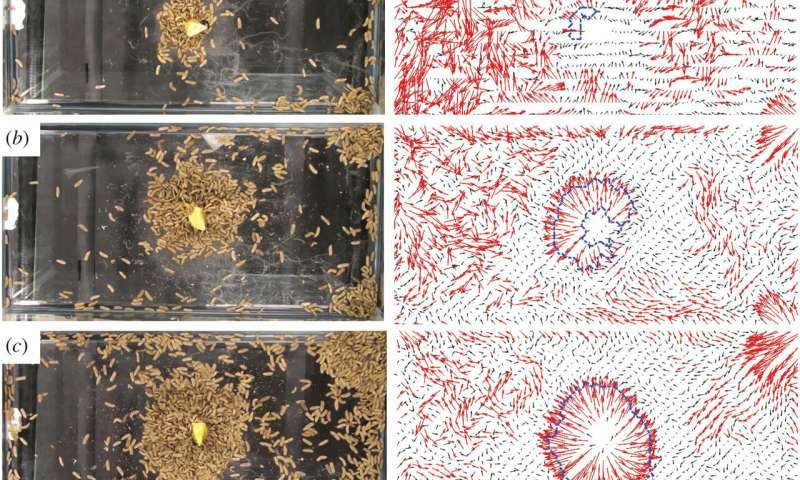 By watching a mass of larvae eat in slow motion, the researchers observed that they exhibit a degree of cooperation that made the process of sharing a meal a more efficient affair. They noted that a single larva did not eat constantly—instead, it ate for about five minutes, then stopped to rest for five minutes before eating again. During the pause in eating, hungry larvae shoved it out of the way. The entire process consisted of a frontline of larvae reaching a food sample first, upon which the larvae would form an ascending mass—those that came from behind the first crawled on top to reach food higher up, and so on with each new arrival. Eventually, they reached a maximum height, preventing the larvae in the back from eating. But as soon as an individual maggot stopped to rest, the larva behind it would shove it up and over the top of its own body, and it would fall down the hill of bodies surrounding the food. The researchers found the whole process flowed like water from a fountain, in which water that is pushed out the top is continuously recycled. The end result is a very efficient eating mechanism that allows the larvae to consume food quickly and also allows each individual in the group to get its fair share of a meal. I knew they were social watching those videos. The mass of them moves around in waves in time-lapse videos.